The Northern Lights Will Be Visible Over the U.S. Friday Night. Here's How to See It. The northern lights are an absolute must-see on pretty much every bucket list. It's one of the natural wonders of the world, and it's not hard to understand why when you're looking up at the mesmerizing display. 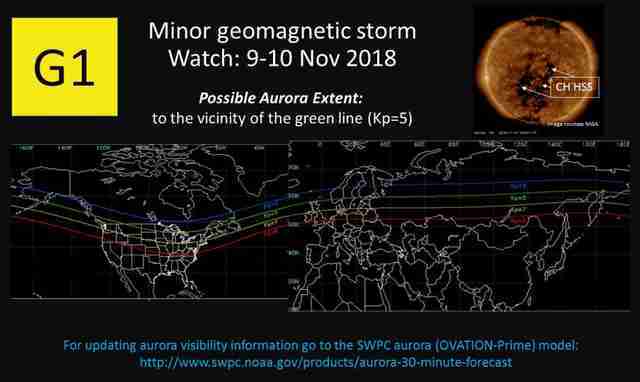 People in the United States may have the rare opportunity to see the aurora on the night of Friday, November 9, as indicated by a G1 (minor) geomagnetic storm warning from the Space Weather Prediction Center (SWPC). The warning was issued because of a coronal hole high-speed stream, according to the agency. However, the important part for stargazers is that the event increases the area in which the northern lights might be seen. That region will include parts of the northern US. The aurora could reach as far south as the green line on the SWPC map above. The area includes parts of (moving west to east) Montana, North Dakota, Minnesota, Wisconsin, Michigan, and the very northern tip of Maine. 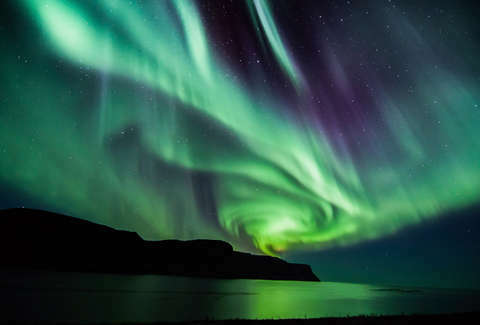 Additionally, you should find a great view in Alaska, where the aurora is far more common, and throughout the vast majority of Canadian provinces. Under a G2 alert, many other northern states would have a good view. Unfortunately, if you're in a southern state you need to travel north if you want to see the show. In the video above, you get a glimpse of the northern lights over the Mackinac Bridge in Michigan earlier this year following a G1 warning. Under these circumstances, you might not have the intense brilliance and well-defined ribbons you might find in, say, Iceland, but the display is still beautiful. Per the SWPC's 3-Day Forecast, the alert is in effect from 4-7pm EST on November 9 and then again from 10pm-1am the same night. The first span won't do viewers in the US any good, because you need very dark skies to notice any aurora activity. That makes the best time to catch the display 10pm-1am in the areas marked on the map. It might seem like all you need to do is look up, but there are a lot of factors that determine your ability to see the aurora outside of whether or not you're in the correct area. Dark skies are a must, so you'll need to be as far as possible from the light pollution of urban centers. An SWPC representative previously told Thrillist, "You need very clear skies, a good view of the northern horizon (no tree, buildings, or hills), and it needs to be dark." Unless you're in an arctic country where the aurora is frequently seen, the bit about the northern horizon is important. You'll want to look to that horizon because it's unlikely you'll see the display covering the sky directly above you as you might if you were viewing in Iceland or Alaska. These alerts happen from time to time (there was a G2 alert just last week), but it's not all that common. Add in the need for the weather to cooperate and that you may need to drive away from your home, and you see that opportunities like this won't come around every day. It's worth taking advantage of it when the chance presents itself in part because we're close to the solar minimum right now, which means it's a little less likely that you'll be able to see the display.